The Symposium took place in Krakow on December 12th and 13th, 2016 in Park Inn Hotel. 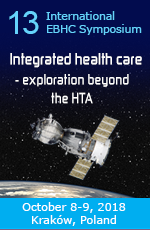 All health care systems in CEE countries are currently undergoing dynamic transformation and therefore the directions of changes within the strategic frame are the subject of heated discussions. Furthermore, integration between social, developmental and purely scientific sectors is sought after. The main reason for changes has been the same for years: the growing crisis of operating costs. While in the past years we focused on different methods of tackling the crisis – from increasing HTA significance, through insurances or harmonising the benefits package – this year we will focus on seeking ways to integrate remedial measures and processes of health care system management. Fixing cash flow problems is similar to repairing a water–supply system – it is not truly fixed until all the holes, not only the biggest and most visible ones, are caulked and filled. We need to look for new values, crucial for decision–making with regards to shaping the guaranteed benefits package (both drug and non–drug technologies) so as to put it into a common legal and financial frame covering reimbursement, participation of science and research and patients’ needs. The first session titled: “A roadmap for the process of reimbursement and tariffing of health benefits” will cover the planned changes in the field of reimbursement solutions for drugs and medical devices. We will also investigate tools for their implementation – HTA and tariffing and ways to unclutter the package, including elimination of technologies. Apart from national experts, we will host speakers from Hungary, Slovakia, Romania and Bulgaria – countries which are currently building the basis for future changes and are undergoing a constant transformation. Due to its exceptional educational value, the participation in the first session will be free of charge. This way we want to encourage those who cannot take part in the entire Symposium – students and fellow scientists – to participate in the event. It is an opportunity to establish direct contact with representatives of the Polish Ministry of Health and The Agency for Health Technology Assessment and Tariff System (AOTMiT). We hope for a lively discussion after the session. We would also like to discuss – in line with this year's theme – the effectiveness of legislation and implementation processes for introduction of changes in the light of the system's inertia, the size of the area submitted to regulations and the necessity of engaging different groups of stakeholders. The number of levels of coordination and communication in the health care system may paralyse even the most committed reformers. Fortunately, we are not the first who face this problem. Guest experts, both from countries with a stable health system and those undergoing changes, will be eager to share their experience in the field of research on the size of phenomena for the needs of planning changes, assessment of the effectiveness of solutions, implementation of benchmarking and some thoughts on experience with unsuccessful solutions. We will focus on these aspects during the rest of the first day within the frame of the second session "CEE Forum: Value-based decision making in CEE countries”. How is the medical devices market changing and what is the trend dynamics? Is tariffing the golden remedy for all problems? Is care coordination possible? If so, on what levels? What benefits does it bring to the system in general? The main focus of our discussion will be to determine whether it is possible to find ways to assess the effects of the solutions implemented so as to inscribe them in the aforementioned legal and financial frame. 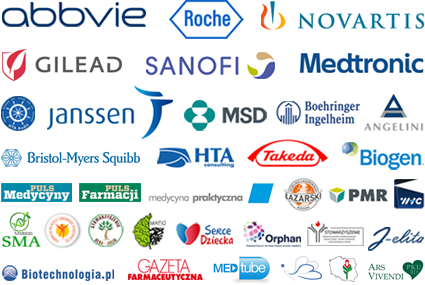 Managing Partner in Sequence, a Polish research and consulting company which operates in the healthcare area. Expert in the health market – he specialises in financing and strategy as well as in the pharmaceutical market. He has 25 years of experience in market research and consulting for the healthcare market. He has been with Sequence since 2008 and before that he was head of the Polish and Central European Department of IMS Health and managed Azyx, a research company, for many years. Author of various publications related to the Polish healthcare market, with particular focus on the pharmaceutical market. He graduated from Medical University of Warsaw and obtained his MD degree in 1985.
since 2016, president of that Section. Piotr Czauderna in also a regional consultant on Paediatric Surgery in the Pomorskie region and Coordinator of the healthcare section at the National Development Council (NRR). He graduated from the Medical Academy In Gdańsk as well as the Gdańsk Foundation for Management Development and IAE Aix-en-Provence (MBA). Managing partner of Ideas & Solutions (I&S). He also holds a position as research leader at the Corvinus University of Budapest, Hungary, where he lectures pharmaceutical policy and funding. Dávid has 13 years of experience in health care management & the funding of pharmaceuticals and medical devices. Until 2010 he was member of the executive team for pharmaceutical reform in Hungary as deputy director of reimbursement at the national health insurance fund. He speaks regularly at conferences and workshops on pharmaceutical and medical device policies, gives payer communication and negotiation trainings to multinational companies and authorities and he has co-edited a university textbook titled Pharmaceutical Reimbursement. Jaroslav founded OAKS Consulting s.r.o. in 2009, after more then 15 years of experience in top management positions in Wyeth, Zentiva and Glaxo. OAKS Consulting has became in short time the leading consulting company providing full scope of services in Market Access in Czech Republic. The team currently consists of 15 specialists with professional background in medicine, pharmacology, mathematical modeling and health-economy. Wolfgang is a member of the management board of Medtronic Germany GmbH and is responsible for the areas of health economics, market access and health policy. He develops and evaluates strategies for Medtronic therapies and products, the market launch and initiates with the decision makers from medicine, politics and health insurance the establishment of new forms of cooperation for patient care. Due to the wide product spectrum of Medtronic GmbH, Mr. Frisch has experience in the field of inpatient, and ambulatory care. Mr. Frisch has been working in the medical technology industry for over 20 years. He was responsible for business development for Stryker GmbH & Co. KG in Germany, Austria and Switzerland and was responsible for the national key account and corporate account management of Dräger Medical AG. Brian works with the World Health Organization, governments, health authorities and health insurance companies across Europe to enhance prescribing efficiency within scarce resources. This includes potential ways to value and fund new medicines incorporating suggested models to optimize their use post launch. This has resulted in multiple publications and presentations to address these key issues. Current Director of the European Network for Health Technology Assessment (EUnetHTA) JA3 Directorate. Between 2010 and 2015 he was the Project Leader of WP5 of the EUnetHTA JA1 and JA2 on Relative Effectiveness Assessments. Until the beginning of 2013, he was also the Deputy Secretary of the Medicinal Products Reimbursement Committee at Dutch National Health Care Institute. He has a PhD in immunology and an advanced education in (pharmaco)-epidemiology and pharmaco-economics. He has more than 70 publications in peer-reviewed international journals. Since 2011 Head of Global Health Technology Assessment (HTA) Scientific Strategy at Sanofi Genzyme, company based in Cambridge, Massachusetts. Researcher and associate professor at the School of Medicine of University of Barcelona until 2007, entrepreneur, international specialist in technology assessment and health care systems, was responsible for the creation and management of the Catalan Agency for Health Technology Assessment and Research (CAHTAR). Director and general manager of the Catalan Institute of Health (ICS) and later Leader of the Health Evidence Network (WHO – European Regional Office). Bioregió (BIOCAT) Ambassador and of the International Society for Health Technology Assessment (HTAi) of which she was founder. She has been president of Forética and has more than 60 scientific and health care policy papers published in international peer review journals. Former President of Autonomous University of Barcelona’ Board of Trustees. Currently Dr Granados is also member of the Advisory Council for the Economic Growth of Catalan Autonomous Government since its creation in 2011 and since 2014 she also serves as President of Scientific Advisory Committee of AquAS (Catalan Agency for Quality and HTA). CEO of the NEPI foundation initiated by the Swedish Parliament in order to promote pharmacoepidemiology and health economics, co-localized and in close collaboration with the National Centre for Priority Setting in Healthcare. Specialist in clinical pharmacology and in infectious diseases/internal medicine. Chairman of the standing committee for pharmaceutical policies of the Swedish Society of Medicine. Member of the scientific advisory board of the Medical Products Agency in Sweden. Former member of the pharmaceutical benefit board of the Dental and Pharmaceutical Benefits Agency, TLV. Former member of the steering group of e-health at Swedish Association of Local Authorities and Regions. Former director of pharmaceutical strategies, County Council of Östergötland. Alastair Kent came to Genetic Alliance UK over 20 years ago because he was excited by the challenge that new knowledge in genetics created - the idea that, for people affected by a genetic condition, yesterday’s science fiction is tomorrow’s clinical service improvement. Trying to transform these possibilities into positive outcomes whilst reducing the potential for abuse is an incredible challenge, and he feel incredibly privileged to work in this field. The fact that Genetic Alliance UK is now a respected and authoritative voice for patients and families is something about which he feel pride, and also a huge sense of responsibility. Katarzyna Kolasa, currently works as Senior Health Economics and Outcomes Research (HEOR) Director at GE. She has been working for healthcare sector for more than sixteen years now. She worked for AstraZeneca and BiogenIdec in both global and regional HEOR functions. At Bristol Myers Squibb and Lunbeck she was leading Market Access teams in CEE and Nordic Region. In the past she worked in Sweden, Switzerland and Finland. She holds a PhD degree in health economics and is an author of the number of publications in the field of health technology assessment and pharmacoeconomics. Katarzyna Kolasa is a reviewer for manuscripts submitted to Health Policy, Value in Health, Expert Review of Pharmacoeconomics & Outcomes Research and International Journal for Equity in Health. Her extensive knowledge in the field of health economics was acquired at University of York, University of Lund and University of Bergen as well as during International Doctoral Courses in Health Economics and Policy organized by the Swiss School of Public Health. Katarzyna Kolasa is DIA tutor for HTA courses, teacher at MBA in health program at Lazarski University, HTA training at Business School of Technical University in Warsaw and Adjunct at Nicolaus Copernicus University Collegium Medicum in Bydgoszcz. In addition to her role as a University teacher, she lead Equity study as a part of InterQuality project organized by Warsaw Medical University, funded under the European Union’s Seventh Framework Programme. She worked for World Bank regarding the hospital management project as well. Her practical skills in the field of health economics and insight into payers needs were developed during her six years employment contract at the Kalmar County Council in Sweden where she was responsible for a number of public health research programmes. Expert in health technology assessment and health economics. For several years she has been specialising in quality assessment (audits) of analyses included in HTA reports. Author and co-author of systemic studies in healthcare and scoping aiming at determining the directions and scope of analyses required for reimbursement and pricing purposes. Partner in HTA Audit. Active instructor in the fields of EBM, HTA and Pricing in public institutions and the pharmaceutical industry. Director at the Lazarski University’s Institute of Interdisciplinary Studies for rare diseases, lecturer at the Postgraduate Education Centre, president of the Polish Association of Support for Prader–Willi syndrome (PWS) Patients, expert on health matters at the Jagiellonian Club’s Analyses Centre, vice-president of the Polish Society of Medical Communication. Deputy Director of Drug Policy And Pharmacy Department in the Ministry of Health, former Head of Analysis and Strategy Division in the Agency for HTA and Tariff System, Chief Expert in the National Health Fund (NHF) and Specialist in HTA Consulting. Currently, Senior Healthcare Consultant, both in public & private health related projects. Since 2015, Dr. Mardare is dedicated to medical education and personal development of the young professionals, as assistant professor in Public Health and Management Department, University of Medicine and Pharmacy „Carol Davila” Bucharest, Romania. Physician with both medical and Health Outcomes Research background, with a vast experience on healthcare and health system management. Along the 25 + years of activity, she had the opportunity to work and learn in various positions, at different levels - medical practitioner (Infectious Diseases Specialist), hospital manager, Medical Director of a County Health Insurance House, senior counsellor - Ministry of Health, Public policies Department and also in Pharma Industry - from Medical Representative to Senior Health Outcomes Manager/ Public Health Manager. As a result, she has a deep understanding of the Romanian Healthcare System in dynamics, from different perspectives, from big picture to tiny details that can make the difference. Professor Rafał Niżankowski, MD, PhD is a member of the European Working Group on Medical Angiology IUA. He is initiator of the angiology medical specialisation in Poland, co-founder of the Polish Angiology Society, creator and head of the Angiology Clinic of the Jagiellonian University. He is regional consultant on In the field of angiology and President Elect of the Polish Angiology Society. Since 2006 she is President of the Pharmacoeconomics Section within the Pharmaceutical Association of Serbia. Founder of the ISPOR Serbian chapter and between 2007 and 2009 its vice president. Tanja Novakovic is a graduate of the University of Belgrade, Faculty of Pharmacy finishing her postgraduate studies at the Faculty of Pharmacy at Ghent University in Belgium. Author of the “Handbook for pharmacoeconomic evaluations”, the first publication in the field of pharmacoeconomics in the Serbian language. Author of the first Guidelines for pharmacoeconomic evaluations for Serbia. Co-author in one of the three HTA reports first completed in Serbia, and was engaged to lead a group of experts to define all existing elements of basic benefit package in Serbia within the World Bank/Ministry of Health of Serbia projects. Tanja has organized and presented in many national meetings and international conferences which have resulted in international cooperation in education and the developing of pharmacoeconomics and HTA in Serbia. She founded and currently leads the company Pharm-In, Ltd, offering its services in the field of Market Access (registration, pricing and reimbursement, pharmacoeconomics) that works since 2008. Maria Psenkova has an extensive experience in management positions in the pharmaceutical industry. Worked in marketing, sales and market access and with her teams successfully introduced to the pharmaceutical market several innovative medicines in various therapeutic areas. She has experience in the execution of drug policy regulation, she worked as advisor to the Ministry of Health and as consultant for Health Insurance Company. Since 2011 she is lecturer at Slovak Medical University and currently holds the position of Past President at ISPOR chapter Slovakia. Paulina specialises in EBM. Since 2014 she has cooperated with MedInvest Scanner which assesses investment risk of innovative non-drug medical technologies and carries out due diligence. In the years 2013-2014 she worked as an auditor at HTA Audit which assesses the quality of analyses making up HTA reports. Author of many publications. She carries out training courses in HTA and EBHC. Co-author of projects titled Pro Aegrotis Oncologicis – basic principles, directions and preliminary proposals of changes in the oncology care system in Poland and Indirect costs in HTA – methodology, pilot study and recommendations. Paulina graduated from Public Health at the Jagiellonian University Collegium Medicum. President and CEO at Anchor Bay Consulting. He was Vice President of Global Health Economics, Policy and Payment for Medtronic’s CardioVascular Division. In this role, he was responsible for ensuring that reimbursement is a consideration in every functional area from product conception, through research and development, clinical and regulatory affairs, product launch and marketing. Prior to joining Medtronic, Mr. Sugarman worked at Kaiser Permanente for 19 years initially as the Director of a clinical genetics department, and later as the Director of Medical Technology Assessment. This position involved tracking new drugs, devices and procedures as they moved from experimental to non-experimental, and determining whether they should be part of the medical armamentarium. Critical issues evaluated included safety, efficacy and cost-effectiveness. Mieczyslaw is Head of: the Department of Paediatrics, Paediatric Endocrinology, Diabetology, Metabolic Diseases and Cardiology at the Pomeranian Medical University in Szczecin, the Coordination Team for Growth Hormone Application and the Coordination Team for Ultra-rare Diseases. He is a member of the Team for Rare Diseases advising the Minister of Health. He co-founded the Polish Registry of Congenital Malformations. He is the National Consultant in the field of paediatric endocrinology and diabetology. He is the Head of the Polish Society of Paediatric Endocrinology and Diabetology. He is a member of: the General Board at the Polish Paediatric Society, the Social Council at the Western Pomeranian Child Hospice and the Senate of the Pomeranian Medical University in Szczecin. Between 2006 and 2013, he was Head of the Council of Clinicians – the Chief Medical Doctor of the Independent Public Clinical Hospital no. 1 in Szczecin. Mieczyslaw Walczak is a member of the Scientific Council at the Children’s Memorial Health Institute in Warsaw and the Scientific Council at the Institute of Mother and Child in Warsaw. He authored or co-authored over 450 publications and statements from conventions and scientific conferences. He was awarded the Silver Cross of Merit and the Gold Medal for Long Service. He was also distinguished by i.a. the Silver Honorary Badge of the Szczecin’s Griffin and the Józef Polikarp Brudziński Honorary Medal. He graduated from the Faculty of Medicine at the Medical Academy of Poznań. Attorney-at-law, deputy director of the Drug Policy and Pharmacy Department in the Ministry of Health, member of the Tariffs Council advising the President of the Agency for Health Technology Assessment and Tariff System in Poland. Co-author of the commentary to the Act on reimbursement of drugs, foodstuffs for particular nutritional uses and medical devices. President of CEESTAHC Society, CEO of MedInvest Scanner, Vice President of HTA Consulting.In HTA Consulting, she is responsible for the strategic development of the company through research and services development, new product launch and marketing. Ms. Wladysiuk main and primary aim is to provide high quality information or data based on evidence based medicine or health technology assessment methodology not only in Poland but in Europe and Asia. Key role of her work is to improve patient outcomes through better healthcare decisions. She graduatd Medical Academy in Lublin and MBA, economy in Kozminski Academy in Warsaw. Wojciech is the head of Department of Health Technology Assessment in the Agency for Health Technology Assessment and Tariff System in Poland. Former head of the Pharmaceutical Department at the Central Office of the National Health Fund and former head of the NHF in Dolnośląskie province. He was also the medical director of the Provincial Hospital in Jelenia Góra and hospital in Środa Śląska. He graduated from Wroclaw Medical University and Oskar Lange Wrocław Academy of Economics. Vladimir, PhD(c), brings more than 20 years of Health Economics technology and business experience. Since 2000, in various roles as Health Economist, Project Manager and Chief Investigator, Vlad has implemented more than 150 health economic models and assessments in the phase 2, 3 and 4 settings, across various disease areas for top 30 global pharmaceutical companies. Vlad worked extensively over the last 6 years in opioid dependence. His PhD research on early vs. late HIV detection in the United Kingdom contributed to revisions in HIV early detection policies made by the UK Parliament in 2011. He co-founded the Serbian Chapter of the International Society for Pharmaco-economics and Outcomes Research (ISPOR) in 2007 and served as President of that chapter until 2012. Vlad is an active member of various ISPOR special interest groups (SIG) (including rare diseases) and is ISPOR Central East Europe Executive Committee Chair 2015-2017. Vlad lectures extensively and serves as a key opinion leader in the areas of HEOR, opioid addiction, HIV, diabetes and other. He also consults and provided HEOR training relating to both medications and medical devices to Ministry of Health, National Insurance Funds or at national congresses in Russia, Turkey, Greece, Egypt, Poland, Czech Republic, Slovakia, Hungary, Croatia, Bosnia & Herzegovina, Slovenia, FYROM, Republic of Srpska and India. Wojciech has been Head of the Department of HealthCare Benefits at the National Health Fund since 2015. He is an active businessman and a specialist in obstetrics and gynaecology. He worked as a doctor in the Dr Madurowicz Provincial Specialist Hospital in Łódź in 1997-2000. He was head of the Gyneacology and Obstetrics Department in Medical Centre in Pabianice in the years 2010-2011. Since 2011 he has worked on management positions in various medical centres. He graduated from the Faculty of Medicine of the Medical Academy in Łódź. In 2013 he finished postgraduate studies in HealthCare Management at the School of Banking and Management in Cracow.